Going on a Letter Hunt…. 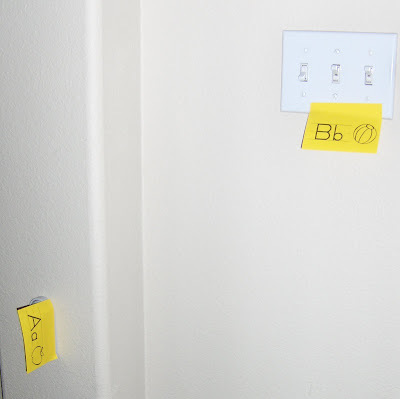 While B was napping one day I took these letter sticky notes and hid them all over the house. When he woke up I told him there was an alphabet mystery (referring to a favorite book) downstairs and he needed to help me solve the problem. When he found a sticky note he would bring it to me and tell me what letter it is and what sound it makes. Then I put them in order on the counter so we could see which letters we still needed to find. After we finished, he hid them for me to find. Fun! Don’t have letter sticky notes? No problem. Make your own with regular sticky notes and leave off the picture. Next time, I will plan ahead and stick the letters on things that start with that letter (L on the lamp, D on the door) so we can work on beginning sounds! Toilet Paper Tube Alphabet Crafts – What do you do with them? Letter and number hunts are a regular at our house! Love it! I love this! I think I will do this today with my kids! 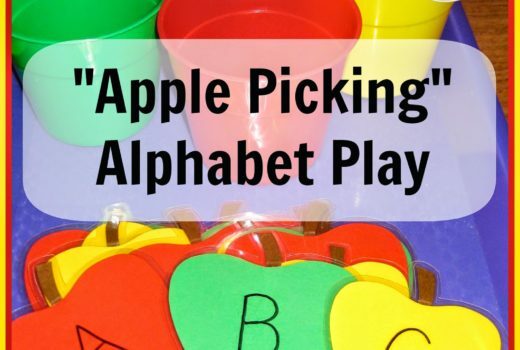 I love ALL your alphabet activities! Great idea! I’m trying this with my boy the next time we’re all here doing school. He’ll think it’s great to have an activity just for him! Love it!! I have extra sticky notes handy… you know, I think I’ll do this right now. Would make a great surprise for my littlest people when they wake up. My daughter just found some sticky notes. If I can figure out where she put them I think I will do this for tomorrow. We are having playgroup here this week (will be posting about it later this week on my blog, the idea came from our Pp lessons) and this could be a fun game. Thanks for the idea. This is awesome! And since my son is currently napping, I may go set this up right now! LOVE this idea! Where did you get your letter notes at? And I really like the idea of putting the sticky notes on items around the house that actually start with that sound. This would be such a fun game – thanks for the idea! What a cute idea! My girls and I went on a letter hunt in our neighborhood and took digital photos of the letters. Need to get back to this project. We are going to make a letter book. They really enjoyed searching for the letters and using the digital camera. That’s a good idea!! I stay home with my 3yr old and I’m trying to teach him the sounds. I think he’ll like this game. Thanks for sharing. I’m definitely coming back for ideas. Great idea! Will follow u for more! Where did you get those stickies? They are cute. I did this with sight words in the summer last year, leading up to Junior Kindergarten. Every day while my son was napping, my daughter and I would play word hunt, it was a lot of fun. I let her hide the words and I would hunt and then we would switch. Tip: Always count how many you hide so you know how many to look for! I got the sticky notes on sale at Walgreens after “Back to School” time. Casey, love that idea to reinforce letters and the song too! Multi-Tasking Mommy, great idea to hunt for words! You could even put the words into a sentence after you find them all!